He was loved by cinema going audiences when he first appeared in the early 1940’s and almost up to the present day, along with his nemesis Sylvester the cat, the little canary like cartoon character Tweety Pie. The two of them proved beyond doubt that there had become one of the most notable pairings in cinema animation history. The plot followed a well-loved formula of Sylvester desperately wanting to catch and eat Tweety, but the bully always has something in the way of his ambition, usually Granny or her bulldog Hector! Sylvester, of course, never wins Hector comes to the rescue, or Tweety draws the poor unsuspecting Sylvester to the edge of a building, or brick wall at speed! Our Tweetin Mad Ashtray will not lead you into these situations, but will ensure that your smokes when completed are disposed safely and the ash is contained in the ashtray when the top half of the head is removed. Inside also are three useful spaces where you and your friends can rest your smokes. 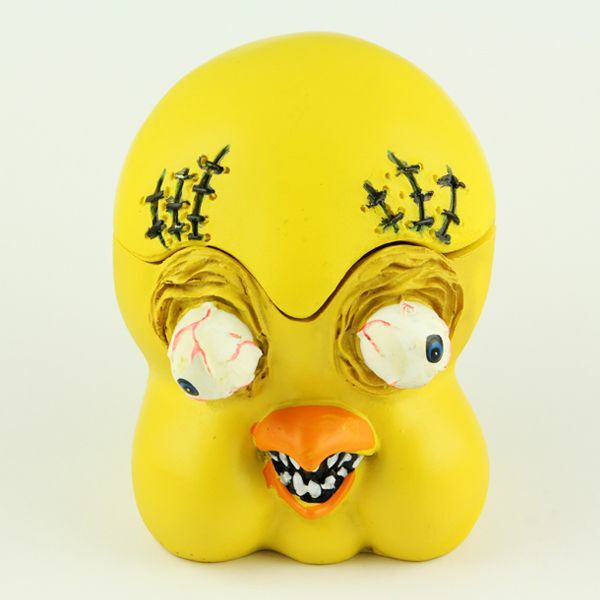 Naturally the ashtray is in canary yellow and we feel sure that it will not only serve a very useful purpose, but also provide some fun, especially to those that were fans of the cartoon character.